The fourth Screen Plays season of theatre plays on television will be shown at BFI Southbank in January 2015. The season, titled Classics on TV: Great American Playwrights, presents six rarely-seen television productions of theatre plays by Tennessee Williams, Eugene O’Neill, Arthur Miller and Clifford Odets, and others. The productions collectively demonstrate how theatre in the United States has spoken with honesty and conviction about the elusiveness of the American dream and the individual’s search for meaning amid swirling political and social changes. The season showcases work which grapples with questions of personal identity, ideas of exile and rootedness, and the politics of race and gender. You can read more about the Great American Playwrights season here. Booking opens on 9 December (and today for members! ): www.bfi.org.uk and 020 7928 3232. I will be writing blog posts about the four of these productions which have only received minimal discussion on this blog – namely, in my survey essay on American drama on the British small screen which I compiled in the summer. The two other productions, Strange Interlude by Eugene O’Neill (BBC, 1958) and Arthur Miller’s The Crucible (BBC, 1981) have already been the topic of substantial blogs written by my colleague John Wyver and myself respectively. 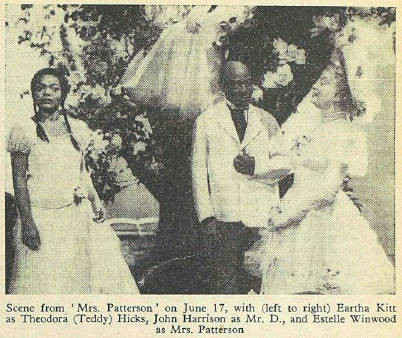 Today I begin this new series of posts by considering the BBC’s 1956 Sunday Night Theatre production of Mrs Patterson, a play about race and adolescence in the Deep South by the African-American painter-playwright Charles Sebree and Greer Johnson (about whom less is known). This production was something of a landmark in an era when plays on British television were almost exclusively written by white authors – and on this the crucial reading is Stephen Bourne’s Black in the British Frame: The Black Experience in British Film and Television, published by Continuum in 2001. Mrs Patterson is also a beautifully preserved gem from the early years of extant drama on television. This rarity opens the season at 6.00pm on Wednesday 7 January 2015, and the 75-minute production will be followed by a panel discussion and Q&A (details to be announced). Mrs Patterson had premiered on Broadway just two years before Anthony Pelissier’s BBC production for the Sunday Night Theatre series. The summary of reviews of the theatre production offered by the 16 December 1954 issue of the magazine JET can be summed up in the by-line ‘N.Y. critics cool on Mrs Patterson, Hot on Eartha’. 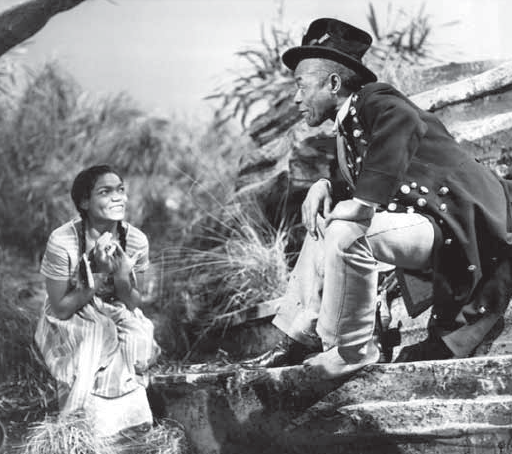 Eartha Kitt was the star of this Broadway production which gave her her first straight starring role. Brooks Atkinson, for example, writing in The New York Times, declared Kitt to be ‘an incandescent young woman with lively intelligence, a darting style of movement, keen eyes and an instinct for the theater’. In the television production, too, Kitt gives a captivating performance. She is Teddy Hicks, a poor, illegitimate, black fifteen-year-old girl who spends much of her days daydreaming about living a life of luxury like her mother’s wealthy and well-travelled white employer, the ‘Mrs Patterson’ of the play’s title. Songs from Kitt and Elisabeth Welch (playing Bessie Bolt) characterize the fantasy sequences arising from Teddy’s rich imagination, giving the performance a rich fantastical dimension which, with ease, permits her to play cards with the Devil and be included in Mrs Patterson’s sophisticated social gatherings. The reality of her life breaks in increasingly, however, and a crisis point is reached at the end of the play when she agrees to agrees to run off to Chicago with Willie B., the boy-next-door, played by Neville Crabbe. Evelyn Dove plays Teddy’s mother with grace and poise and Estelle Winwood is the Mrs Patterson of Teddy’s fantasies. This was Kitt’s second appearance in a straight play on BBC television. Her first was as the mysterious murderer Jane Dyke in the 1926 American play The Valiant by Holworthy Hall and Robert Middlemass, adapted for television by Anthony Pelissier. No recording of it seems to survive, but that it was considered to be a production of note is indicated by the fact that it featured on the cover of the advance issue of the Radio Times, pictured adjacent. Do please come and join us in watching this rare screening at BFI Southbank on Wednesday 7 January 2015 and enjoy the panel discussion and Q&A afterwards. Last night’s screening of Mrs Patterson, plus the panel discussion and Q&A with my Screen Plays colleague John Wyver and Michael Billington, theatre critic of The Guardian, made for a really rich start to the Classics on TV: Great American Playwrights season! Thank you to all those who came along. It was terrific to see so many people there! Mrs Patterson was, of course, even more wonderful on the big screen than it had been when viewed on the tiny Steenbeck screen in the vaults of BFI Southbank last year. It was obvious back then that we had unearthed a gem, and the season has given us a valuable opportunity to be able to show it on the big screen. 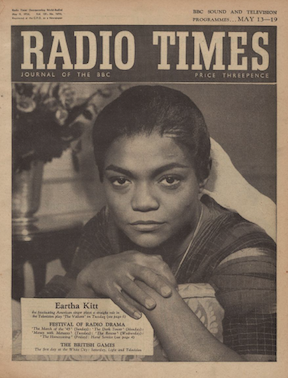 My memory of it being a really strong performance from Eartha Kitt, who is on screen for almost the entirety of this charming play, was confirmed, and the songs from her and Elisabeth Welch were a treat. Discussion included some fascinating context about American plays on the British stage from Michael Billington, who also offered a valuable reading of this little-known play as an early, and effective, statement of black power, in that the central character ‘Teddy’ Hicks ultimately rejects her adolescent dream of growing up to be a “rich, white woman” and instead vows to take on the world on her own terms, as herself — Theodora. Billy Smart, from Royal Holloway, commented that the relatively primitive production methods of 1956 worked well for the storytelling structure of the play which moved back and forth from reality to imaginative sequences. The two different parts of the set were used for real-life and Teddy’s imaginings respectively, and a simple but effective echo was added to voices to mark out the imaginary sequences. I talked about how different was the response of the critics in the press (who were positive and thoughtful in their reviews) from that of the majority of domestic viewers who, as we know from a BBC audience research report which had sampled 221 viewers, thought very little of the production. This is rather puzzling — not all of the criticisms (for example, that the action was ‘slow’) are justified. Lez Cooke of Royal Holloway valuably contribute the idea that viewers may have been objecting to the form, and the innovative techniques, at play, such as the long takes and the mobility of the cameras (techniques that producer Anthony Pelissier would later go on to develop further in work for the experimental Langham Group). Speculation as to why this early production exists in the archive was traced back to the important fact that — as Stephen Bourne, the author of Black in the British Frame, suggested, and as is confirmed by John L. Williams’ biography of Kitt, America’s Mistress, p. 188 — this was the first play to have been done at the BBC’s new Riverside studios in Hammersmith. Stephen was also able to add much valuable contextual detail, and it was really great to have brief biographies of some of the supporting actors. Some broader thoughts about the legacy and the possible futures of theatre plays on British television were also addressed, with Michael Billington reporting that he was one of the generation whose early theatre-going was valuably supplemented by seeing regular performances of theatre plays on television. He remembers Pinter’s The Birthday Party and Shakespearean series The Age of Kings as being particularly memorable, and regretted bitterly that today’s television audience do not have the same opportunity to broaden their cultural experience — although it remains to be seen whether the centrality of theatre performance within the ‘event cinema’ repertoire will somehow legitimate screen engagements with theatre to the extent that much more theatre will one day, once again, be seen on television. It was fascinating to see Eartha Kitt in such a dramatic role. Her mercurial expressiveness was vital to the success of the piece – and indeed it was quite a revelation to me. My only memories of her (from my childhood) were as a rather sultry singer with an inexplicable habit of giggling at the end of each song. I say inexplicable, because no-one could explain it satisfactorily to me as a 7 or 8 year old. An interesting aspect of the production (which was mentioned by someone during the discussion) is that the camera is so focussed on Teddy that the first ‘appearance’ of her mother is extremely veiled, a clever intimation of the way that Teddy shuts out reality in favour of her dream-world. It is quite some time before the mother is properly seen by us. It is just one example of how the limitations of camera technique in the mid 50s are used to advantage to show the relative importance of things in Teddy’s consciousness. This is also matched in the sound-world of the piece, where the voices often seem to fade in as if Teddy is only gradually becoming aware of them as they intrude on her inner life. This is particularly true of her mother again, and of the appalling intrusive neighbour Aunt Matty.